As part of "Call for Incredible" campaign, Purina Pro Plan invited dog owners to share photos and stories explaining what makes their dogs incredible. Each entry triggered a one-pound food donation of Purina Pro Plan to America's VetDogs, an organization that trains and places guide and service dogs with veterans who have disabilities. As a result of the campaign, Purina Pro Plan donated more than 15,000 pounds of dog food. To celebrate the 20th anniversary of the Purina Pro Plan Incredible Dog Challenge (IDC), Purina Pro Plan hosted an exhibition event on the historic USS Midway Museum in San Diego on Tuesday, Nov. 7 during Veterans Week. The event marked the conclusion of the brand's "Call for Incredible" campaign celebrating the incredible things dogs are capable of, and featured demonstrations of agility, 30-weave racing, and freestyle flying disc by top IDC canine athletes on the deck of America's longest-serving aircraft carrier of the 20th century. Footage from the event can be seen here. 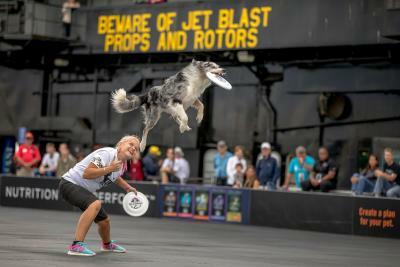 "For two decades, the Purina Pro Plan Incredible Dog Challenge has been giving talented canines a stage to demonstrate their amazing athletic abilities," said Christi Maginn, Brand Director, Purina Pro Plan. "We're honored to host this special event abroad the historic USS Midway Museum, America's living symbol of freedom, during Veterans Day week." "America's VetDogs is honored to partner with Purina Pro Plan to highlight the service of our military men, women and canines. Purina Pro Plan's commitment to share our mission of serving veterans with disabilities as well as highlight the important work and impact highly-skilled service dogs provide our nation's veterans when they return from duty is invaluable," said Wells B. Jones, CEO from America's VetDogs. "Service dogs play a tremendous role in leading veterans to lives with dignity and independence while providing support, mutual love and companionship." Purina Pro Plan is committed to delivering high quality nutrition to help fuel dogs so they can do the incredible. Whether they're protecting our country, jumping off docks or napping on the patio, there's a Purina Pro Plan formula to meet dogs' specific nutritional needs. Purina Pro Plan is dedicated to helping promote healthy living in dogs of all ages and activity levels through nutrition that performs. Dog lovers in southern California were invited to come to the event and show their support aboard the USS Midway Museum in San Diego. For those who couldn't attend the USS Midway event in-person, a one-hour televised special will air in syndication in January 2018. For more information on the Purina Pro Plan Incredible Dog exhibition event on the USS Midway Museum and tune-in details, visit www.proplan.com/incredible. Purina Pro Plan is the food of choice for 10 of the past 11 Westminster Best in Show winners*. Our goal is to give your dog the nutrition to be his absolute best, helping him to be energetic and resilient, and maintain an ideal body condition, healthy skin, and a stunning coat. Because being the best he can be means something different for every dog, our wide range of dry and wet foods and snacks, sold exclusively at pet specialty stores, can be found in four specialized categories formulated for a dog's unique needs. For more information, visit www.proplan.com or follow @ProPlan on Twitter, Instagram, or Facebook. The brand is manufactured by Nestlé Purina PetCare, which promotes responsible pet care, humane education, community involvement, and the positive bond between people and their pets. A premiere global manufacturer of pet products, Nestlé Purina PetCare is part of Swiss-based Nestlé S.A., a global leader in nutrition, health, and wellness. Be sure to catch Charlie, the VetDogs 'Puppy with a Purpose' daily on NBC's TODAY. America's VetDogs has been accredited by both the International Guide Dog Federation and Assistance Dogs International.